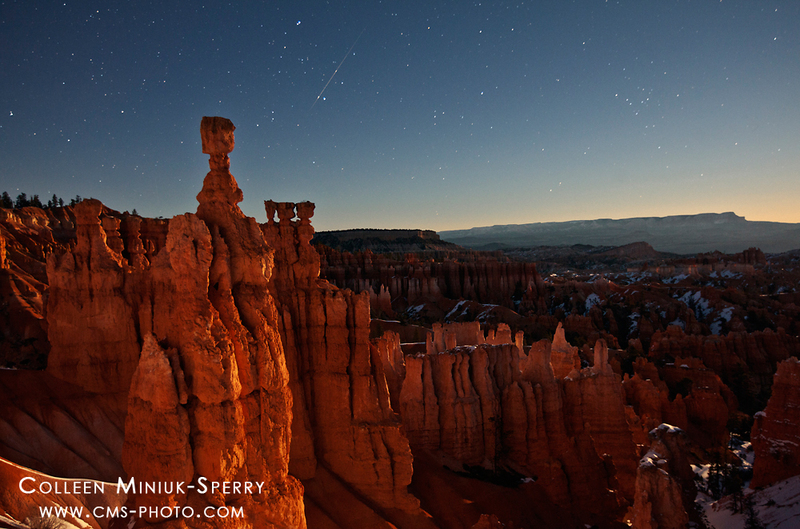 “Reaching for the Stars” A shooting star falls over Thor’s Hammer and Bryce Canyon at moonrise in Bryce Canyon National Park, Utah. Prints available – click on print to order! Today, February 28th, marks my 6th anniversary of my personal Independence Day, the day I walked skipped joyously out of my grey cubicle walls of Corporate America in 2007 to begin this amazing journey as a freelance photographer and writer. I joined Intel in September 1997, fresh from graduating from the University of Michigan-Ann Arbor (“GO BLUE!”). Brimming with excitement of “going West,” I started with the company as a software test engineer, then moved on to systems analyst and project management roles within the transportation and logistics, factory automation, and training departments. Though I worked with so many inspirational, talented people doing remarkable things and enjoyed working for such a generous company, over the course of ten years, I realized it just wasn’t my path in life. I was safe in the harbor, but that’s not what I was built for. How did I know I was ready to sail my ship into somewhat unknown open water? Almost two years of planning and preparation ensured I could make the freeing transition to freelancing. Though scary at first, after 2190 days have passed since my escape, I still can’t believe I’m so fortunate to live such a fulfilling life. Working as a one-person show in a many-ringed circus, juggling marketing, finance, human relations, manufacturing, and training tasks sounds much more appealing than staying in your current position working with clowns. If the photography gig doesn’t work out, your backup plan is to serve hamburgers at a fast food restaurant, not return to your current occupation. You’ve run out of dead relatives – no one honestly believes your grandmother has passed away six times since January – and vacation time. Or perhaps you’ve used so many sick days, your co-workers think you have some highly contagious unpronounceable disease. Your desire to become a freelance photographer derives from a burning passion to inform, educate, and inspire others. You should not make the choice to leave your current position based on lack of other employment options or the idealistic notion of what a National Geographic photographer does in the movie, The Bridges of Madison County. As El Presidente of your own business, when things go right, you’re to blame. When things go wrong, you’re to blame. And this complete accountability and control excites you. When you work for yourself, no manager will stand over your shoulder telling you what, when, and how to do your work. Are you self-disciplined, independent, and highly motivated enough to sail your ship through the occasional fog and stormy weather? Family and friends support you beyond “Wow, that’s a pretty picture, George. You could totally sell that!” Your moral support network willingly buys your photographic prints for the holidays, spends hours editing your articles, and cooks you dinner when you forget to eat while putting together a submission. Ever heard the joke: “How do you make a million dollars as a photographer? You start with two!” Starting any new career, let alone one in photography, with financial debt is not a smart decision as you’ll be transitioning from a stable income to a fluctuating one. Put off buying that expensive lens (you don’t need anyhow) and instead ensure you’re financial obligations are low. You’ve already tasted the “good” life by working as a freelancer in conjunction with your current 40-hour work week and have found enough work to cut ties and independently generate income now and in the foreseeable future during self-employment. Are you ready to sail your ship out of the harbor? What do you feel you are built for? Are you currently planning your own Independence Day? Thank you so much for your continued support! Cheers to Independence Day…in February!